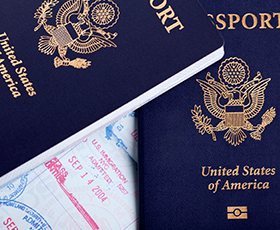 Did you know that US citizens can hold a second passport, also known as two valid passports, at the same time? If you are a frequent traveler who doesn’t have time to get visas before you leave for your next trip, or if you need to travel to a country that won’t allow you to enter if you have Israel visa stamps in your passport, you can get a second passport. These are also called “second valid passports” and issued for four years validity. Get your Second Passport Expedited in 24 Hours! Keep reading for a full guide on how to apply for a second passport. You have Israel stamps in your passport and have travel planned to a country that may deny entry, such as Iran or Syria. Your current US passport – Your full validity (10 year) passport, also called your “primary passport.” If you are renewing a second valid passport, you must also submit that passport. One passport photo – Must be a different photo than the one that is in your 10 year passport. Second passport letter of request – This letter is addressed to the US Department of State and must be signed by the applicant. The letter must describe the specific reason you need to get a second passport (either two trips leaving in close succession, the second one requiring visas, or upcoming travel to a country that does not allow entry if the traveler has Israel stamps in the passport). By Mail – You can mail in your second passport request to be processed at the National Passport Center. At a Passport Agency – If you are in a rush for a second passport, you can go in person to one of the 26 US Passport Agencies located in major US cities. If you want to apply in person, you will need to call the National Passport Information Center at 877-487-2778 to make an appointment. By a Passport Expediting Company (RECOMMENDED) – Using a reputable passport expediting company is the best way to apply for a second passport. Not only is it fast – they can get your second passport in 24 hours if needed – but they are passport experts and can help you with the complicated requirements for a second passport. They will thoroughly review your second passport application packet to make sure it will be accepted. How long does it take to get a Second Passport? Applications sent in by mail will take up to 8 weeks for processing. Even if you pay the additional $60 in government fees for expedited service, the second passport will take 2-3 weeks to be processed. If you need a second passport, you probably need to get it fast! Using a passport expediting company is the best way to make sure you get the ultimate in expedited service for your second passport. They can get second passports in 24 hours!